Keeps air in the tractor or truck should the trailer break away or develop a bad leak. The trailer air supply control on newer vehicles is a red 8-sided knob used to control the tractor protection valve. Push it in to supply the trailer with air, and pull it out to shut the air off and put on the trailer emergency brakes. The valve will pop out, thus closing the tractor protection valve, when the air pressure drops into the range 20 to 45 psi. Tractor protection valve controls or �emergency� valves on older vehicles may not operate automatically. There may be a lever rather than a knob. The �normal� position is used for pulling a trailer. The �emergency� position is used to shut the air off and put on the trailer emergency brakes. In order to allow the trailer brakes to be applied more quickly, what is connected to the service air line? The service line (also called the �control line� or �signal line�) carries air controlled by the foot brake or the trailer hand brake. Depending on how hard you press the foot brake or hand valve, the pressure in the service line will similarly change. The service line is connected to relay valves. These valves allow the trailer brakes to be applied more quickly than would otherwise be possible. The emergency line (also called the supply line) has two purposes: (1) To supply air to the trailer air tanks, and (2) to control the emergency brakes on combination vehicles. Loss of air pressure in the emergency line causes the trailer emergency brakes to come on. The pressure loss could be caused by a trailer breaking loose, thus tearing apart the emergency air hose. Or it could be caused by a hose, metal tubing or other part that breaks, letting the air out. When the emergency line loses pressure, it also causes the tractor protection valve to close (the air supply knob will pop out). The emergency air line is usually what color? Emergency lines are often coded with the color red (red hose, red couplers or other parts) to keep from getting them mixed up with the blue service line. 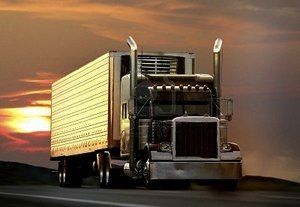 �Glad hands� are coupling devices used to connect the service and emergency air lines from the truck or tractor to the trailer. The couplers have a rubber seal that prevents air from escaping. Some vehicles have �dead end� or dummy couplers to which the hoses may be attached when they are not in use. This will prevent water and dirt from getting into the coupler and the air lines. Use the dummy couplers when the air lines are not connected to a trailer. If there are no dummy couplers, the glad hands can sometimes be locked together (depending on the couplings). It is very important to keep the air supply clean. When coupling, be sure to couple the proper glad hands together. To help avoid mistakes, colors are sometimes used. Blue is used for the service lines, and red for the emergency (supply) lines. Sometimes, metal tags are attached to the lines with the words �service� and �emergency� stamped on them. Older trailers do not have spring brakes. If the air supply in the trailer air tank has leaked away, there will be no emergency brakes, and the trailer wheels will turn freely. If you crossed the air lines, you could drive away, but you would not have trailer brakes. This would be very dangerous. Always test the trailer brakes before driving with the hand valve or by pulling the air supply (tractor protection valve) control. Pull gently against them in a low gear to make sure the brakes work. It is important not to let water and oil build up in the air tanks. If you do, the brakes may not work correctly. Each tank has a drain valve on it, and you should drain each tank every day. If your tanks have automatic drains, they will keep most moisture out, but you should still open the drains to make sure.